November 25, 2014: An ever-growing village of music. B-139. Wonder what that one is on the jukebox? The trumpet in the opening was pretty great. The opening sounds are wonderful. Everyone everywhere should be listening to this, take a deep breath, relax, and enjoy just the right amount of cowbell. Sorry, got excited there. Usually I'm passed out on my couch by now. such a wonderful start to the show - so happy to be listening in the evening for a change! Hey Irene! Think I spotted you at last Thursdays screening of the FMU doc! Good Evening Miss Trudel and hello all on the board. I'm so happy that perhaps a whole new audience gets to know the utter Greatness of Irene's show. I really am. On this night, for many reasons, these sounds are very welcome. Greetings, Irene and newbies and oldbies. Got any Incredible String Band, in honor of Clive Palmer? Hi everybody! Glad you're all here to settle in for the evening with me. Yes @V Priceless, I was in the WFMU documentary audience. I quite enjoyed it. @ Van, I wish I knew what was on that jukebox. That picture was taken about 10 years ago, and sadly the shop it was housed in-- Village Music in Mill Valley, CA-- is long gone. Hi Irene and Trukeepers! Great start to the show! I never knew Village Music but with a name like that I'm sad it's gone. Greetings also Jake, RRN63, fleep, adrian, Mugsy, Henry, newbies, "oldbies", familiars and yet-to-meets! @Van: Another local fan of Irene's! :) I lamented Monday's loss of Irene, but this timeslot is so much better for me to listen live! Esp. Thursdays...I'm used to changes at new schedules, but this past one was just too much of it. @Jake: Rock 'n Roll all parade morning, and eat turkey every day. ha, speaking of which, I was just for the first time ever watch "Rock of Ages" before this show tonight. That would have been what I zonked out on. I thought I was gonna miss not having Irene to help me make it through my workday, but I solved that problem by working long hours, as I am right now. Irene, I hope you are settling into your new time slot comfortably now. I know it's a big adjustment for you. BUT THANK YOU FOR STAYING ON!! Right there with you, Gaylord. Good evening, folks. Evening Mike! And hiya Gaylord! @Mike East: This show is an oasis. I can say Todd O Phonic put on a Rock and Roll show this past Sat that will go down in FMU history. Wow. not hard at all...listening to radio, and trying to edit some tracks on my computer. Studios are quiet but for a Grateful Dead cover band. THREE INCHES OF SNOW! JEUSUS HAS FORSAKEN US! @Van in DC: I'm almost done (mostly waiting around at this phase), and Irene is giving me a soft landing. And hello, Matt from Springfield. 1 to 3 inches? In DC that's a "Snowdoompocalypse"!! Same in DC. Maybe up to 3 to 4 inches? @ Matt. Yeah I think he's filling in for Dave Thursday night! Break out the militarized snowblowers left over from the War On Terror™! @Henry: Snow-ball War on Terror, in this case! You people… Inhuman… Three inches of snow… The week of Black Friday and that other holiday!?!?! 3" makes for lousy snowballs! We'll have to truck in some more snow. Irene did you see Sharon Van Etten's new Spotify session live thingy she posted today? Very nice indeed. Especially Tarifa, but I just ADORE that song. Andy Waltzer commented about Clive's passing on fb, yesterday. 3" sounds like about 5 minutes of Buffalo snowfall. @Andrew: May your cookies be delicious and in tune! Ladies and Gentlemen, the amazing Sharon Van Etten! Gaylord, happy to give you a soft landing to the workday. Van, I'll certainly check out the KaTe rendition of that Donovan song. So pretty! I didn't see Sharon's Spotify session but will have time at work. I've been doing a lot of thumb-twiddling there lately while they decide what to do about Soundcheck. These strings are just what I think, well, everyone needed. "Decide what to do"? I love Soundcheck. I listen a lot. They have good stuff, and YOU. @Irene Trudel: Thank you, dear friend. Wow nice work fleep! I think you nailed it! Well I hope Soundcheck's changes do not affect your engineering for them Irene! Yup, Jake. Soundcheck is no longer a radio show. But I will still be engineering live music for them when they book it. Hi Sean in UK! Hi Kat! Hi all of you European listeners dipping in on archive, and elsewhere! Please take a moment to post a hello to Irene in the comments. The FMU archives have been a Godsend for me for years. Well, I wish you well in the endeavor. hello, this is my first time listening to this show. Sounds good! Welcome melinda! You're in for a long, wonderful treat. I love how this happens. It is inevitable. Irene, you will rule the world, eventually. Ken is so screwed. 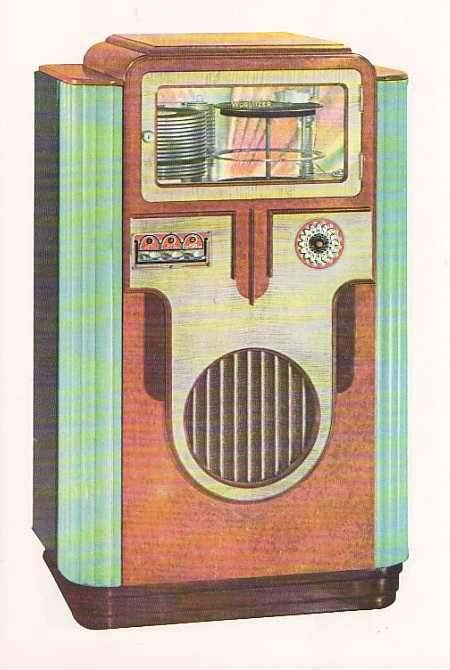 1936 Wurlitzer jukebox has such a face! : reminds me of fave book 'Monster Show' discoursing on the Bauhaus movement's influence on 'Frankenstein' 1933 (same year as 'Dracula' & worst year of Depression). The only thing with this new time slot is now I feel like I just HAVE to go bring up Jim Price on archive afterwords. Haha! Yes the archives rule, and glad to welcome new listeners like you, Melinda! I mean REALLY! The FMU archive genie is the BESTEST THING EVER. Pure magic! Pretty much the most powerful musical force on the planet. For my money. And I mean that. All of it. FMA is close. But really, nothing else. Must say, I've missed you Matt. We just haven't crossed paths lately. I knew a few old bars with great jukeboxes and selections. These gingerbread men are delicious and in tune. Get Bill back on live! @andrew - yum - they'd go well with the hot cocoa i just made! I don’t like winter. I don’t hate it. It is. As usual - just gorgeous, beautiful sets. Me too Van. I'll be online for this show, but I need to start planning more VA and DC wide Meetups! Been too long since the last one. I did not make your last one, sorry. I am so ready for the next one Matt. @Van: I'll get on it then! Start asking the other listeners around here. Talk about an all-star cast. I think Mark Isham also flew in from time to time. I was working in the Monday timeslot - & Evening seems right for IreneT - esp. in Winter. The problem is WWOZ has great Vintage R&B Mon. & Tue. nights - whatcha gonna do...Archives usually don't help me much, 'cause one needs a Timeslot to listen to them in ! So nice to hear again Irene this Tuesday evening , turned in and all I can say , as I sip my tea ,, ahhh! Will there be any Steeleye Span? Tangerine Dream? Cocteau Twins? Pentangle? Maddy Prior? This Mortal Coil? Ahh, that smooth, slick Arista sound. At least that's what VS seems to be emulating! @RRN63: Like I say, opportunity costs: you're always missing something in this world. Life is about choices. And not all choices are limiting. Especially when there are archives, downloads, robots, drones and librarians. My mind is not working any longer. I might drop out soon, but fear not I shall always and ever catch up on archive if I falter. I really like having Irene in this time slot. It's the Liz Burg/Tony Coulter conflict that bugs me. I am enjoying the WFMU Favorites button. Years ago I'd have a piece of paper near the radio and I'd wait for the back announcing! My Archive Genie is a rack of air check cassettes. So, any fans of the sitar? Anoushka Ravishankar and Joshua Bell...? I thought fans of this show would appreciate a world class meet up of very different strings. Thanks Van, that looks fantastic! are people being quiet tonight? rev rabbit- unfortunately i don't have the monster show any longer, but i remember how absorbing skal's contextualization of the horror genre was. Oooh, that Hundred Waters was good! And coming to the 9:30?.. So i might retire to my couch whilst listening still meaning I will shortly be zonked. Archives await. I've done what damage I can tonight. So many thanks Irene. You remain the BESTEST. THE BESTEST. Ooof, it's this Saturday @8, too much going on with T-giving to make it to that one. Though *if* you are in the DC area on Sat and want something to do, there's a good opportunity! Zonk out, Van! Good night, catch you later! She's great live. Saw her at Victo this year. is everyone PSYCHED for thanksgiving???? feel myself zonking, too. time to heat up my coffee. I am, Queen. My favorite holiday. Queen, I saw someone in my neighborhood put up Thanksgiving decorations and I almost cried. No Thanksgiving decorations… But all these ads—big and small—for Black Friday. The WFMU Store is great! Many premiums are only available by pledging during a particular year; but there's other Prize Warehouse items (usually those not show specific, like T-shirts and the Locked Groove LP, Best of LCD, etc) that you can purchase any time of year! All to benefit our Magic Factory. Yah.. the Black Friday thing is happening in Canada now too. @Mike: One advantage of a night time Irene show: she could play Dave Van ZONK! wearing my wfmu hoodie right now (as well as sinners xroads tee)....I could totally rationalize getting another. Isn't Black Friday a holiday in the Church of Stop Shopping? I always try to buy as little as possible on Black Friday. We're all sufficiently zonked out, I hope. Happy to send you to dreamland. @Andrew, I didn't want that before, but now its ALL I want. Though I might settle for the Scharpling/Wurster Box Set. RESIST these Black Friday shopping crazies, Mike!!! BTW, Black Friday is also Buy Nothing Day. @Mike: That's 2 degrees of separation from Fela, NICE! What I hate about Black Friday? It’s yet another thing that has passive aggressively hitched itself onto another thing. Thus making the other thing almost cursory. Excellent choice, Irene. The FCC fine for playing prog on FM will be deducted from your paycheck. Yah, I feel the same way when people in Canada want stores to hold off on putting out Christmas displays until the day after Remembrance Day. Another good one for the Hoof 'n' Mouth Symphonia. "Long-tie listener, first-time commenter"... well, not first-time, but dirst in a long time. I'm simultaneously glad and d=sad about the new schedule. Ch-ch-ch-changes... But more Neon Phil in my life? What could be bad about that? Irene in the PM though... a good thing,but will take some adjustment. That wold be "time", not "tie". Dagnation. A great one indeed, and this Robert Plant is a good conclusion. Next week: another episode, and another chapter! Thanks Irene! Glad you all could listen and comment in. Clearly I shouldn't be allowed near a keyboard after my bedtime. Thanks for tuning in everybody! Off to dreamlabnd for me. Catch you all next week! My WFMU hoodie - the zipper broke last week (my fault), and I took it to a tailor to repair. I am paying THIRTY DOLLARS for that freaking zipper repair. That's how much I value my WFMU hoodie. Well Irene you seem to have picked up a hyper bunch of commenters this time of night. Must be all the E numbers. Love the jukebox, guessing it is a late 40's Wurlitzer. Those books on the right look like Thames & Hudsons World of Art. A great series if so, used to work in a bookshop, ah those days of youth. Wow, this has to be a record with comments, fantastic. Thanks for the mention, Van, as always much appreciated. Going to catch up with the show today, looking at the playlist this is going to be a good one. Ha, just happened to stop in. Enjoying Tuesday today. Happy Thanksgiving!